Before I dive into why having a vision is essential for your creative business success, let us take a moment to understand what having a vision actually means. Having a vision is more about feeling than thinking. It’s the distilled version of your wish list and your dreams. It’s all about the future, and how you want to impact it. It’s focused and, most of all, inspiring. In short, it’s WHY you do what you do. Modern, forward-looking business cultures are embracing the importance of having a vision more and more. What was treated as a (not so) catchy slogan has become the guiding light for many organisations. A great exponent of this idea is author, speaker and consultant, Simon Sinek, who pretty much owns the word, ‘Why’, and his book and TED talk on the subject are definitely worth a good look. ‘But what does that all have to do with me?’ I hear you saying. Most creative business owners run small businesses or are going it alone. Having a vision is fine for the big guns, but where does it fit in to a small, creative business? And, frankly, what’s the point? Good that you ask! There are at least 5 huge points. A recent research project conducted by Patricia van den Akker, director of The Design Trust, placed a lack of direction and vision at the top of the list of why creative businesses fail. I mentioned the motivational and practical advantages of setting longer term goals in a previous post, and your vision is essentially a life long goal with purpose. As the ultimate visionary, Steve Jobs, once said, “Passion is meaningless without a vision. A vision is how you will make the world a better place”. For that reason it is always your rock, your anchor, your lode stone. Businesses and individuals can use their vision to determine strategy, growth and financial targets. Imagine for a moment your vision is ‘Everyone has a right to stay warm. That’s why I knit hats’. Keeping everyone warm doesn’t appear a realisable goal, but it is an inspiring vision. Perhaps your vision inspires you to donate a percentage of your sales to a suitable charity, or choose suppliers or materials based on ethics, attend certain events that echo your cause, define your workplace guidelines for you and your team, and so on. Use your vision to direct your decision making in your business and stay true to course. Let your vision work for you! Communicating your vision to your colleagues and your customers will really help get them on board. Let your vision flow into your branding and build a real identity. Share your vision eagerly. Use it when you talk to people, when you describe your business in written communications, in your marketing materials and advertising. This isn’t a cheap trick. If you really believe in why you do what you do, you have every right to share it. If someone was going to buy a woolly hat anyway, why deprive them of the added joy of knowing it comes with purpose! They may get their friends to buy from you too, just for that reason. Creative businesses often encounter enormous competition and are particularly susceptible to economic climate change. Trusting relationships are key to building your business at any time, but may be the make or break of it when times are hard. Share your vision regularly with your team, your partners and suppliers, and your customers. When your vision inspires others in the way that it does you, you’ve done a whole lot to foster that trust. Having a vision demonstrates your clarity not only regarding direction and focus, but also longevity. Clearly, there is little point in having a vision if you don’t plan to stick around and try and realise it. 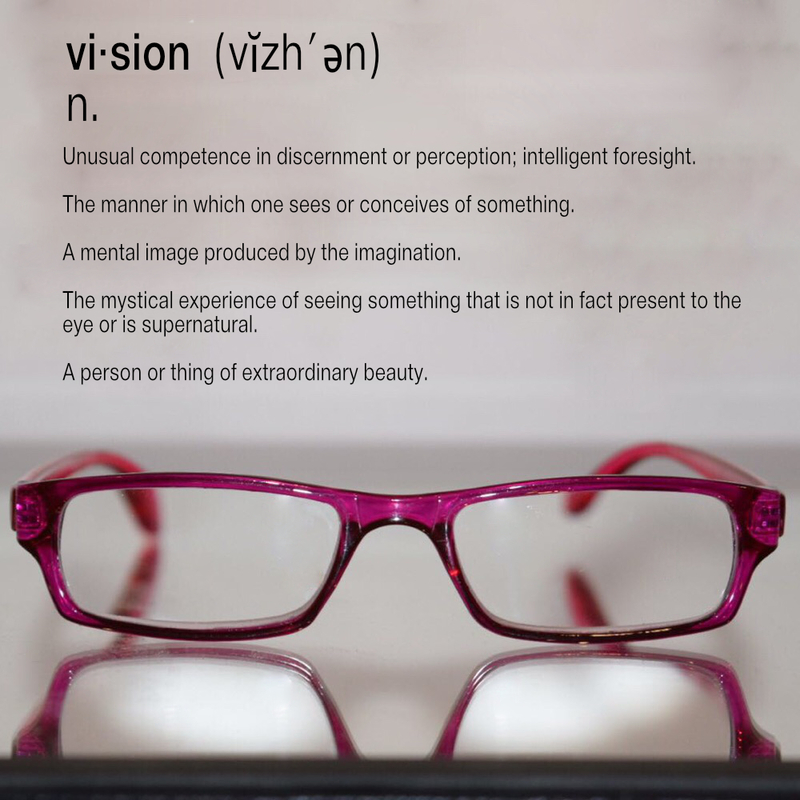 A clear vision is a serious commitment to the future and that lends you and your business credibility. Whether applying for a loan, a competitive exhibition, sponsored training, or a prestigious prize, you can be sure that vision, credibility and commitment will be big factors in your opportunities for growth. If several designers are making knitted hats, but only one of them wants to keep everybody warm, I know which one I’d choose. Having a vision that is bigger than just you can inspire you to great deeds. This can take many forms, from charitable contributions as mentioned above, to passing on your knowledge or engagement. Most importantly, it’s the human condition to find fulfilment in giving back somehow. It’s part of your legacy. Let your vision guide you in finding ways to help others. Thinking of keeping everyone warm and maybe issuing a free e-knitting pattern for schools or community groups? Better still, organising a sponsored knit with the pattern and donating the hats or proceeds. Spreading the word on social media and Facebook groups and you could have a world wide event on your hands. Keeping everyone warm suddenly doesn’t sound quite so out of reach does it? I hope this post has encouraged you to create and formulate your vision. There are many online resources to help you refine your ideas and write a vision statement. If that warrants a separate post or you have other questions, just add it to the comments and I’ll do my best to help. Already have a vision you’re eager to share? Tell us in the comments below and also how it works for you. Love the post it goes down well with me. Glad you enjoyed it Dayo! Very inspiring and some really good thoughts on direction for small creative business owners. Thanks for the positive feedback Andi and happy you enjoyed it. Looking forward to your future posts!